Travel with your lunch inside of the Retro Rocket insulated sack. 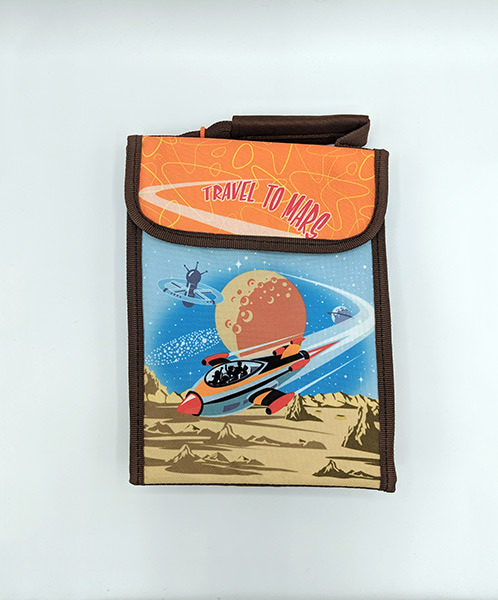 This colorful bag features a Travel to Mars Rocket adventure. This beautiful brown, orange and blue Lunch Sack has extra padding with PVC-free, phthalate lead-free lining. Our Rocket Lunch Bag is big enough to carry your meal or keep other fun things warm or cold. Grab the canvas handle to carry your Velcro sealed sack to your interpanetary party or picnic!